Each service has a database or means for storing stateful data, requires load balancing and can scale at a different pace from that of other services. In addition OpenStack has over 1000 different configuration parameters, making it impossible to deploy and manage without complete automation through configuration management. Support – How much experience does company have with Open Source, Linux, Ceph and KVM? Vision – How complete is the OpenStack story? Does it extend to applications? Enterprise Features – High availability, scalability and support for diversified hardware? Configuration Management – Can OpenStack be managed centrally and deployment be 100% automated? Enterprise Management – Charge-back, governance policies, single-pane-of-glass, hybrid cloud and support for traditional platforms (VMware, Microsoft Hyper-V, RHEV)? Linux Containers – How will OpenStack provide infrastructure for DevOps and containerized next-gen applications? Lock-in – Are you free to choose your underlying hardware vendor for compute, network and storage? I know at least one company that can talk about all of these points and that is Red Hat. In this post we will focus on the Red Hat OpenStack Platform (RHEL OSP). RHEL OSP defines four types of nodes: admin, controller, compute and Ceph storage node. These services enable automated provisioning and configuration management. The admin node can provision two types of OpenStack nodes today: controller and compute. The controller node runs all OpenStack services except for Nova (compute). The Red Hat best practice is to run three controller nodes. The admin node and the RHEL OSP installer will configure a pacemaker cluster that uses corosync for the cluster network as well as fencing nodes. All OpenStack services will be individually clustered with an HA proxy for load balancing. The main reason for running three controller nodes aside from scalability and availability is fencing. Having three nodes provides clear ownership in a pacemaker cluster and as such two nodes is not a valid configuration. The compute node runs Nova (compute) and the Neutron openvswitch agent. Compute nodes do not provide any high availability, if a compute node goes down then all instances hosted on that node are down. The point of OpenStack though is to provide horizontal scaling. If you need more compute resources you simply add more compute nodes. Applications must be resilient and able to handle instances going down, this is a requirement that is often misunderstood when discussing cloud computing. The Ceph storage node runs Ceph services such as the Object Storage Daemon (OSD) that provides storage to a Ceph cluster. These nodes are not at this time provisioned by the admin node and must be configured separately. The admin node will let the administrator configure Ceph as a storage back-end for Glance or Cinder but the Ceph cluster must be available. Ceph requires metadata services however and it is ideal to run these on the controller nodes but other than the Ceph metadata services nothing else Ceph related should be running on OpenStack controller nodes. Ceph is the defacto storage for OpenStack because it meets the requirements for OpenStack storage very well. Ceph can scale far beyond other storage systems and like OpenStack it abstracts hardware allowing you to be free in choice of your hardware vendors. The first step to deploying enterprise OpenStack is to install and configure the admin node. The admin node must at a minimum be connected to the provisioning network. If the admin node goes down you will be unable to provision. In addition if the admin node is providing DNS or DHCP to OpenStack environment those services will be offline. Infrastructure decisions regarding the admin node require thoughtful planning. Before starting the installer ensure your network interface is setup correctly. Below is an example. Ensure your DNS forwarder is a system that can provide external DNS. The DHCP gateway should be admin node itself since it provides DHCP unless of course you want to handle this externally. Change the NTP server, it is critical you provide an internal NTP server or an external one that is available as OpenStack replies heavily on NTP. Enter a list of NTP hosts, separated by commas. First in the list will be the default. Please set a default root password for newly provisioned machines. If you choose not to set a password, it will be generated randomly. The password must be a minimum of 8 characters. You can also set a public ssh key which will be deployed to newly provisioned machines. Now you should configure installation media which will be used for provisioning. Note that if you don't configure it properly, host provisioning won't work until you configure installation media manually. Now that the admin node has been installed and configured we can start our OpenStack deployment. The first step is host discovery. As mentioned OpenStack nodes can run on bare-metal or Virtual Machines. In either case you must configure host for boot via PXE. At minimum the controller node should have three NICs connecting to networks for provisioning / management, external and tenant. The compute node should have minimum two NICs for provisioning / management and tenant. You also generally want an additional network for public API and of course storage. Configure host networking properly before booting. Once hosts are booted foreman will discover them and they will show up in the RHEL OSP installer under Hosts->Discovered Hosts. 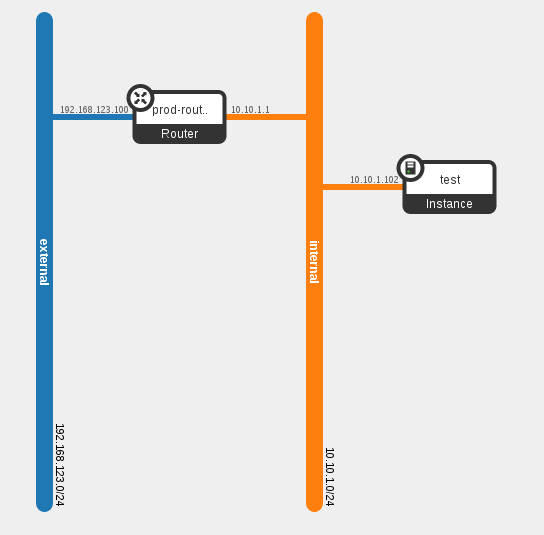 Create Networks in RHEL OSP installer under Infrastructure->Subnet. You should have at minimum three subnets (provisioning / management, external and tenant). It is also recommend to separate public and storage. Below both hosts have been discovered based on MAC address (names can be changed later). Create an external subnet (you need to do this for every network). 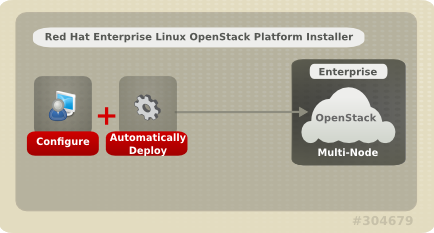 The first step to deploying OpenStack is to create a new deployment by going to OpenStack Installer->Deployments. Creating a new deployment is a four step process that can be observed below. Glance requires a storage back-end, in this case NFS was chosen. Cinder also requires a storage back-end, in this case NFS was chosen. Note NetApp as being an option. Red Hat partners such as NetApp have started integrating into the RHEL OSP installer. Once the deployment has been created we can assign hosts. In this configuration we have one controller and compute node (the minimum setup). Below we will assign controller and compute node to deployment. Keep in mind the beauty of the installer allows you to grow the environment and scale-out more controllers or compute nodes as required. I would recommend starting small until at least the kinks are worked out (see troubleshooting section). Once our hosts have been assigned to a deployment we can update the hosts. In this case I changed the hostname but you can also configure network, domain and realm information for every host. Finally we are ready for deployment. Under Infrastructure->Deployments select the deployment and deploy. The progress can be followed from the UI. It typically takes around 2 hours to deploy an OpenStack environment and periodically you will want to check on the progress. Once RHEL is installed you can log into controller and compute hosts to follow progress at more granular level. The install log is located under /var/log/foreman-installer/foreman-installer.log. Congrats you have deployed an Enterprise OpenStack environment! One of the great features with the RHEL OSP installer is monitoring. You get dashboards, reports and detailed host information that allow administrators to proactively monitor their deployments. Below are a few dashboards to give you an idea of the capability. At this point we have a running OpenStack environment. The last step is to setup OpenStack networking. In this example we will use vxlan for tenant tunneling traffic and a flat network for external access via floating IPs. Configure internal tenant network using vxlan. When complete the network topology should look something like diagram below. OpenStack is not for the faint of heart. If you are expecting click-next and grab a coffee you are in for a rude awakening. OpenStack requires a certain level of Open Source and Linux knowledge. You should understand how puppet and foreman work, these skills are recommended for troubleshooting (especially puppet). You also need decent skills in OpenStack networking (openvswitch) in general. Just because the RHEL OSP installer automates everything doesn’t mean it is autopilot. Before we get into troubleshooting lets understand the basic workflow of a RHEL OSP deployment. provision nodes and install base RHEL. Here are some common problems that I have run into, hopefully they are helpful. Solution: this is a configuration problem. It will occur on the controller node and means that the controller does not have access to a particular network. In this case it was due to only giving the compute node access to the tenant network. This error requires re-configuring network and deployment in the admin node and starting over. Solution: This error was caused mainly by a bug fixed in RHEL OSP 6.0.1. Ensure you are running RHEL 6.0.1, RHEL 7.1 and have performed a yum update. This error requires re-install of the the admin node itself to update to latest version. Error: Deployment completes but br-ex is missing. Solution: the br-ex is an openvswitch bridge that handles external access for instances via floating IPs. If br-ex is missing you wont have ability to assign floating IPs to instances for external access. This could be a configuration problem in deployment. Edit the controller host and ensure the external network has the correct subnet. Solution: this error occurs during discovery of hosts by foreman. It indicates a DNS or firewall problem. RHEL OSP 6.0.1 fixed a lot of problems with discovery but it is important to ensure DNS and DHCP are working correctly from admin node. Solution: this is not generally a problem. Openvswitch creates interfaces for every bridge for Linux compatibility reasons. They are not otherwise used. The kernel does not recognize these devices correctly and hence sees them as down interfaces. Solution: this problem is fairly uncommon however if it happens you need to regenerate certificates. Below is the process. #puppet cert sign "controller or compute hostname"
Enterprise OpenStack is not just about support it is so much more. As we have seen to operationalize OpenStack in enterprise environments we require automation, provisioning, central management / monitoring, declarative configuration management, Linux experience / expertise and of course world class support from a premier Open Source company like Red Hat. The biggest difference between OpenStack distributions and if you will feature disparity lies within the admin node. OpenStack is OpenStack but how it is deployed and maintained will determine your success. This is just the beginning, if you like the current capabilities you are going to love what is coming down the pipe with Triple-O (OpenStack on OpenStack) and over / under clouds. Things are just getting started! As always if you have feedback, ideas or suggestions I would love to hear about them. Hey Keith, yet another great article. Thank you for the feedback I will fix these issues! Can I try installing RHEL-OSP HA in VMWare Environment, like running 5 VMs, 3 as Controller node, 1 as compute and 1 as Installer node..? when i gone through some of the docs, for HA, we need to have IPMI Fencing, will this be achievable in the above said environment..? Kindly suggest. Or I need to do this POC with only Physical servers..Please help me. Since this is a POC you can also choose not to configure fencing. Things will still work just fencing wont but we use Pacemaker and as part of POC customer is probably more concerned with OpenStack uses cases as opposed to testing fencing. My 2 cents…hope this helps! To add a bit more info, it seems the SOAP and agent fence agents are not supported in VMware. This means for POC you can either go with a 1 node controller or 3 but fencing wont work. For production you would want to use physical nodes for the controllers. Also if you think about nested virtualization why would you want to virtualize on a virtualization platform, this is a waste of resources? Thanks Keith. Customer is now asking for Kilo Version of Openstack (RHEL-OSP7) with HA and DR. Any specific doc for the same..? RHEL OSP 6 requires a separate network for provisioning. This is used by foreman to provision new OpenStack controllers or nodes. Foreman runs DHCP, TFTP and DNS so you want this separate for many reasons. The other network card in this case is used for OpenStack networks: public, mgmt, tenant and external. A lot of customers typically use a standard 1Gb interface for provisioning network and then bond together several 10Gb interfaces and use VLANS or VXLANS to segregate OpenStack networks.